With the arrival of the new & luxurious MY Theory to the Galapagos, the sister ship to the MV Origin, many of our clients are interested to know how these Galapagos Luxury Holiday Cruise boats differ. Johnny, our Galapagos Guru, has been lucky enough to have experienced both ships and he gives you the inside track on both of these luxury Galapagos holiday boats. The similarities are that both are extremely luxurious with Relais & Chateau status, meaning a high level of service and great food is guaranteed. Both the MV Theory and the MV Origin are the most luxurious medium sized boats that cruise the Galapagos Islands that cost $7850 per person for a week cruising. The sizes of the ten staterooms are identical with large panoramic windows, en suites, coffee making machines, televisions, apple docs and a very comfortable spec. Both boats are full board with an open bar policy (not the norm for Galapagos). They also both boast the best guide/passenger ratio as every ten passengers has a guide (the Galapagos Park rule is that every 16 passengers requires a guide). They operate on the same itinerary that takes in the highlights of the islands departing from San Cristobal on a 7 night/8 day cruise. The MV Theory was launched in March 2019 and has a slightly different layout and décor to the MV Theory. The jacuzzi on the MV Theory is on the upper sun deck along with sun loungers, on the Origin is on the back of the boat near the loading area. A good idea as you can refresh in the jacuzzi after taking in some of the rays. The dining area on the MV Theory is slightly smaller than on the MV Theory, but still spacious enough. By doing this it creates a larger indoor sitting area for lectures and evening relaxation on the MV Theory. The décor on the MV Theory are light woods, lights blues, greys and a neutral unoffensive décor. Similar in décor to the MV Origin, but the MV Origin is uses more greys and lights yellows. Both are very hard to say which is more beautiful. Both are classically and designed to create spacious and comfortable areas with large windows are observation areas to enjoy the first-class locations that you are in-The Galapagos Islands. For further information and to speak about our promotional offers on the MV Theory please don’t hesitate to get in touch with Johnny. The Galapagos Islands are a unique archipelago in the Pacific Ocean off the coast of Ecuador, South America. Charles Darwin and his Theory of Evolution and countless David Attenborough wildlife documentaries have shed a lot of light on the islands and the ecosystem. Johnny, our Galapagos guru, shares the latest news from the islands. Very exciting news that the endangered species of Scalloped Hammerheads have been discovered in the waters near Santa Cruz Island. This positive news comes after the worldwide population of Scalloped Hammerheads have declined by 90%. The sharks have been fitted with monitoring devices to track them in hope to understanding more about them to improve conservation efforts. Galapagos rangers have discovered a female tortoise found on Fernandina Island. The last female tortoise on the island was discovered around 112 years ago and it was thought they were extinct on the island. The tortoise has been transferred to Santa Cruz breeding center in hope they can breed, with the longer-term goal that multiple can be returned to their natural habitat. After a lengthy quarantine process in Santa Cruz, 11 rangers have released 155 juvenile Espanola Tortoises on Santa Fe island, Galapagos. The species extinct over 150 years ago and these Espanola Tortoises have similar genetics to the species that used to exist. The release Tortoises have all been micros shipped to monitor conservation effort of the Galapagos National Park. Hopes are that they will begin reproducing within the next 7-8 years. In total 549 have been released in the past 5 years. Most Galapagos Holidays are cruises around a pre-determined itinerary stopping at the islands and experiencing the highlights of the each individual islands. The Galapagos Islands have evolved uniquely, meaning that it is important to know what you want to see before selecting your cruise. Johnny, our resident Galapagos guru, has written a series of blogs explaining more about the different Galapagos Islands from Espanola Island in the South East to Fernandina Island in the west. Read on for further information about the magical Islands and Johnny’s top five. The island of Isabela is 20km in length and larger than all other Galapagos islands combined. The North West of the island was a haven for pirate ships to shelter in the calmer coves and bays of the island. Isabela was formed by 6 shield volcanoes making it the most volcanically active island. Charles Darwin visited Tagus Cove in 1835. The current census shows that approx 2,000 live on the island. Highlights or Isabela: There are a variety of micros climates on the island and species have evolved differently according to their habitats. In the west the nutrient rich Cromwell current is loved by fish, whales, dolphins and birds. 16 whales have been recorded here. (inc. Humpack, Sperms, Sei, Minke, Orcas). Other wildlife: Rays, Tortoise, Marine, Penguins, Pelicans, Flamingos, Land Iguana, Hawks, Woodpecker Finch, Blue Footed Booby, Nazca Boobies, Sea Horses, Mangrove Finches and more. Named after King Fernando of Spain as he sponsored Christopher Colombus and his expeditions. Fernandina is known for its eruptions, lava flows and the occasional smoking volcano. 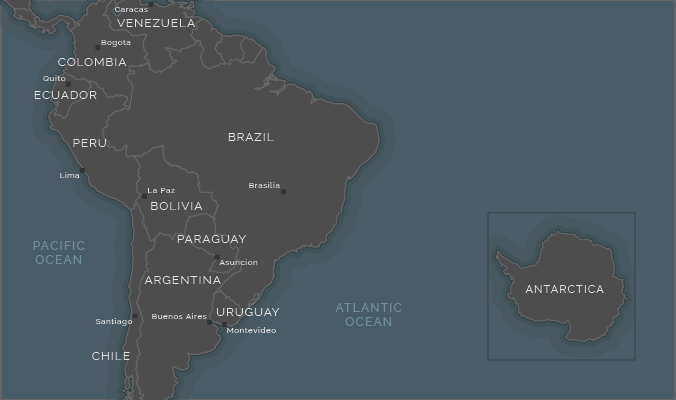 Fernandina is the furthest western island of all Galapagos Islands. It is also the third largest of all islands. Highlights of Fernandina: Large land Iguana population and no inhabitants. Very rich waters to west from cold Cromwell current. Good for Galapagos Penguin and Flightless cormorant. Wildlife includes: endemic Rice Rats, Marine Iguana, Sea lions, Sally Lightfood Crab, Land Iguana, Sea Turtles, Sharks and Rays. It is the southern most of all Galapagos islands and one of the oldest at around 4 million years old. Large number of endemic species due to remoteness. Highlights of Espanola Island: Lava lizard, Espanola Giant Tortoise, Marine Iguana that remain brightly coloured throughout year. Lots of Sea lions. Blue footed Boobies, Nazca Boobies, Red-Billed Tropical Birds. A large blowhole. Gorgeous 2km beach and is the only breeding ground for the Waved Albatross (leaves January-March). Second largest island known as Indefatigable Island after the British HMS Indefatigable. Post WWI many European and Americans settled on the island and today more than 12,000 people reside here. 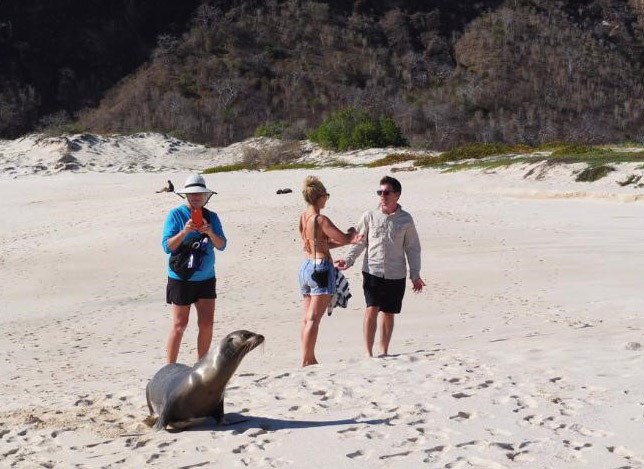 Today Santa Cruz is the main tourist hub of all Galapagos. There are restaurants, cafes and tourists shops long a popular and touristy street. Highlights: Charles Darwin Research Station is a must for all visitors. There is a Tortoise reserve in the highlands. Vermilion Flycatcher, Darwin Finches, Yellow Warblers and other birds. Las Bachas beach is a popular site for turtles. There are 6 dive sites that are accessible as day trips from staying at one of the many hotels. A large volcano collapsed on one side to create the distinct shape of the island that creates a bay (Darwin Bay). The cliff is now home to many seabirds. The island is known as the Bird Island. Highlights: Red footed boobies en masse. The marine Iguanas are the only reptile on the island. Climb the steps made famous by Price Philip where you can spot Nazca and Red Boobies and Storm Petrels. Darwin Bay is a coral beach and shark species are present, with Hammerheads the most abundant. Sea lions, Sea Turtles, and the occasional Manta Ray can also be seen. Johnny will sharing a weekly blog with information on his area of love and expertise every week. Keep an eye on our blog for further information. Please do give him a call or pop him an email to ask any Galapagos related questions. 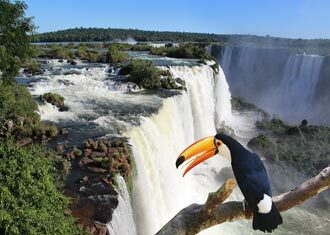 Latin America is a vast and spectacular continent abundant with varying habitats, ecosystems and micro climates. Throughout the continent living in these different areas is a colossal amount of wildlife to seek out and discover. 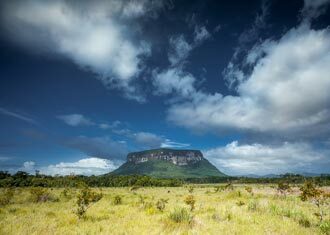 Latin America does not quite have as many luxury lodges that you may find in Africa, however it does have a huge amount of wildlife, fantastic guides and unique areas that are ready to be explored of your South America Holiday. 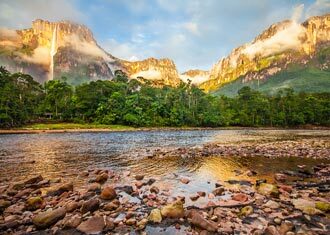 After a prolonged discussion in the office we have finally agreed on our definitive top 5 places for a wildlife safari in Latin America. The Peruvian Amazon Rainforest is an immensely biodiverse and beautiful jungle that counts for more than 63% of Peru’s territory. 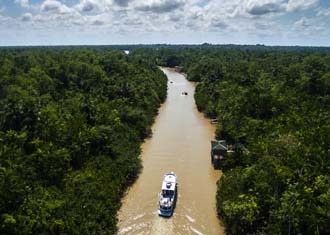 In the north you can fly into Iquitos and embark on a luxury Amazon river cruise. In the south you can fly to Puerto Maldonado before embarking on a canoe down the river to one of the jungle eco lodges. Some of the wildlife highlights are the playful Pink River Dolphins, the resplendent Macaws, the thunderous Howler monkeys and much more. Where to stay: Refugio Amazonas is a remote eco lodge in the Amazon jungle. Staying in one of the comfortable rooms and taking part in the daily small group excursions with their nature guides is the way to first encounter the region. One of the worlds most biologically diverse pockets of planet Earth where you can find over 150 butterfly species, more than 500 types of bird, 124 different mammals, four types of monkey (Squirrel, White Faced Capuchin, Spider & Howler), and all within a 164 mile radius. 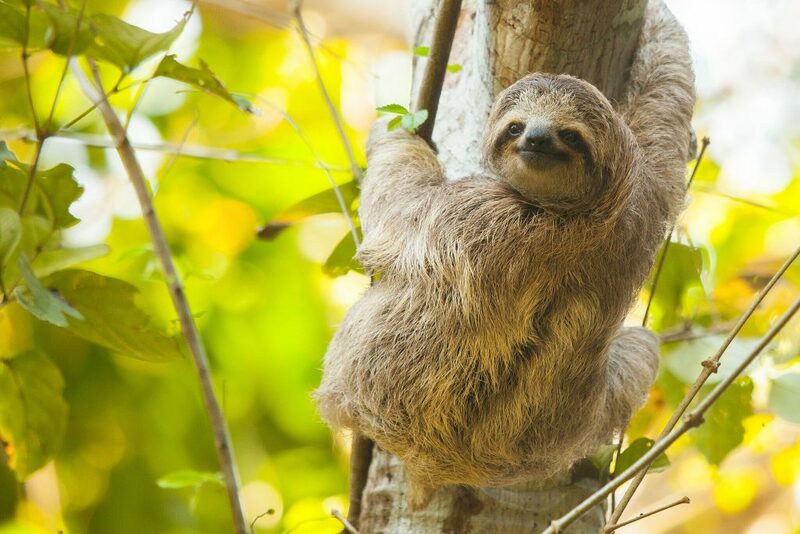 Put simply, this pocket of Costa Rica is paradise for wildlife lovers. Where to stay: El Remanso is a comfortable lodge with very strong eco credentials. It over looks the jungle canopy. For a more luxurious option then Playa Cativo is located in a tropical jungle with a private beach and has excellent wildlife excursions included in the rate. 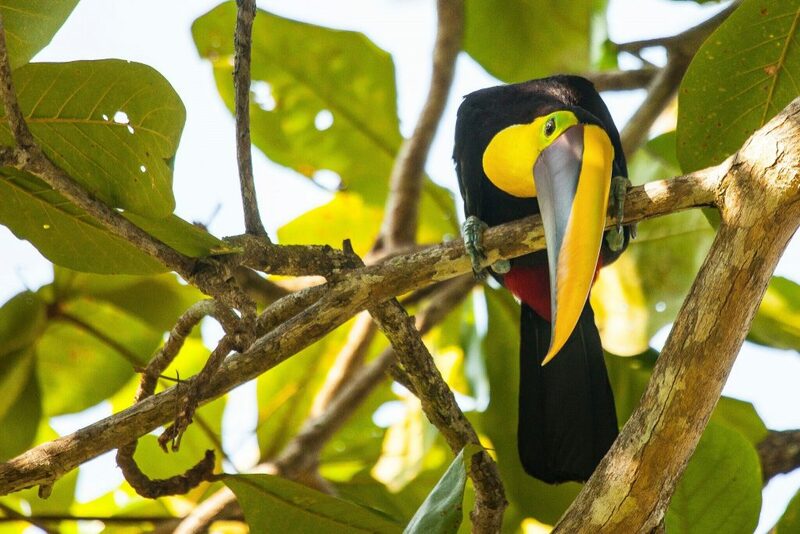 Stretching across three different countries, the Pantanal wetlands is abundant with wildlife. The highlight for many are the Jaguar and Giant Anteaters that call this area home. 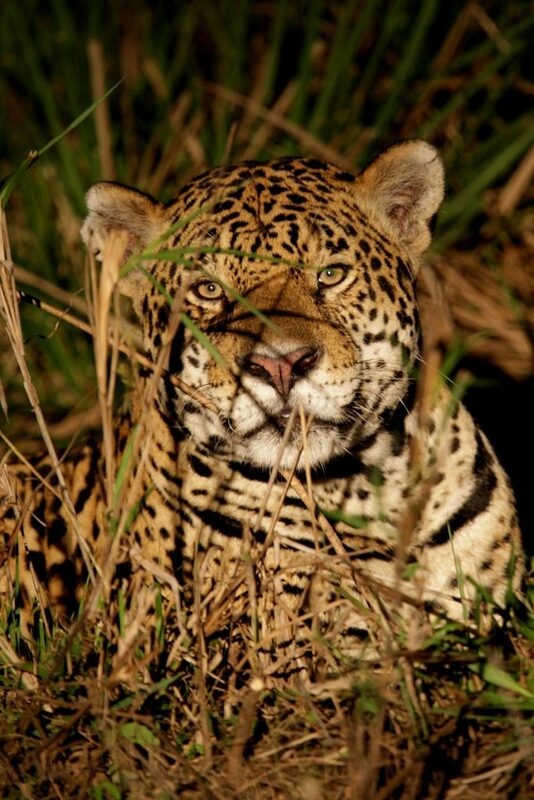 The best place to spot Jaguar is in Brazil. Where to stay. The Caiman Ecological Reserve in Southern Pantanal is one of the most comfortable lodges. We highly recommend spending the the day with their conservation team and go out jaguar tracking. Maybe not the first place that you will think of when thinking about Latin America. Antarctica can be reached by an expedition vessel departing Argentina between the months of November and March. An expedition to Antarctica gives you the ultimate cruise in the footsteps of Shackleton. Penguins (Adelie, Chinstrap, Emperor, King), Elephant Seals, Orca Whales, Minke and much more. Where to stay: Hebridean Sky or Island Sky are two fantastic and extremely comfortable ships run by a professional and experienced team. They have a variety of trips that vary in length and itinerary. Well known as the premier location for wildlife in the world. The Galapagos islands are a unique collection of islands where species have evolved differently. Exploring these islands continually exceeds all expectations and we truly love these Islands that are hard to describe. 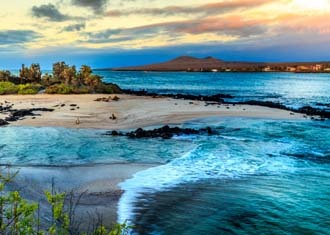 Where to stay: The best way to discover the Galapagos and get a deep understanding is joining a Galapagos Cruise. A stylish way to do this is by joining the luxurious MV Origin or MV Theory for an 8 day/7 night cruise aboard a luxury boutique Relais & Chateaux boat. A more economical option is the Beluga. Getting underneath the cultural skin is often a reason our clients give us for the purpose of their South America Holiday. The team at South America Odyssey have (eventually..) agreed on our top five cultural experiences that we think you should consider for 2019. Have a look at our list, or for further ideas about the many other different experiences please do get in touch. Oaxaca is situated in southern central Mexico, and is an absolute gem in terms of history & gastronomy. This UNESCO protected city has leafy plazas, historical cobbled streets, bustling markets and a distinctive indigenous feel. 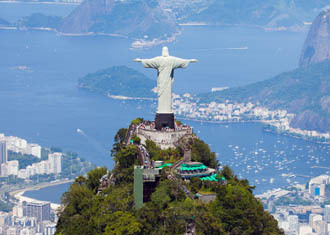 This gorgeous city rates as one of the teams favourite Latin American cities. 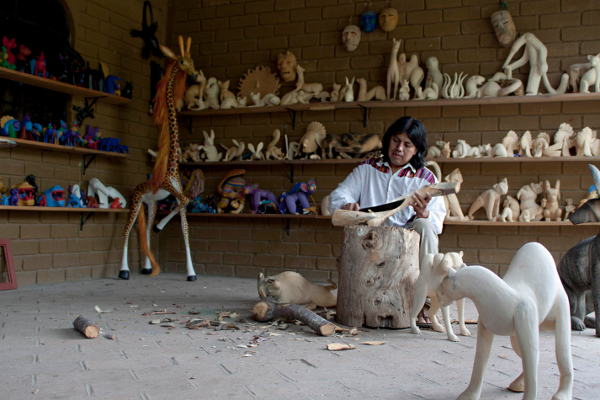 Outside of the city you will find some of Latin Americas most skilled and recognised artisans. Crafts range from black pottery to Alejibres. Zeny Fuentes, an artisan with a small alejibre workshop is a must visit for anyone interested in the local customs, beliefs, art as well as seeing first hand the work of an internationally renowned artist. A Cuba holiday is not complete without an evening soaking up the unique rhythm of the island listening to the local musicians entertain, Cuban style! Think big bands, lots of brass instruments, super vocalists and Cubans enthralling tourists with their elaborate silky salsa skills. An Argentine Asado is a pilgrimage for meat lovers with a thirst for a long afternoon getting your chops around arguably the worlds finest cuts of meat, all washed down with copious amounts or red wine. There are some fantastic estancias (ranches) where you can feast like a local, and enjoy local music and good company. A perfect Sunday afternoon on an Argentina Holiday. 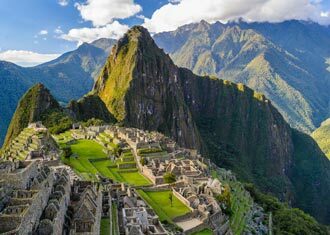 For those lucky enough to secure the limited permits to trek the Inca Trail to Machu Picchu then you are in for a special four days. As you ascend through the Sacred mountains over ancient cobbled roads and through crumbling Inca fortresses and towns you learn about the ancient Inca civilisation and its ingenuity. 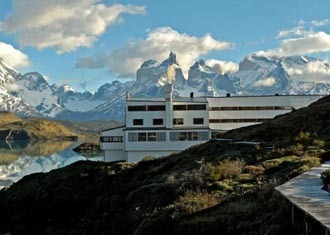 The trek is special, and although it is well on the tourist radar- it remains a highlight for many of us in the office. A interaction and cultural exchange with a remote Amazonian indigenous tribe, done the right way, can be a very special experience for those with an interest in anthropology. There are many indigenous communities across the continent of Latin America ranging from the Kogi in Tayrona National Park (Colombia) to the Hurayos in Iquitos (Peruvian Amazon). There are some very interesting and sustainable initiatives in joint partnership between local tourist companies, and the local indigenous.